TRURO- Guy Strauss was born in Paris and lived in New York and Boston, but for him, there’s no place like the remote seashore town of Truro. "We are all drawn to the environment… It is wild, gentle, tough and tender," says Strauss, who moved there full time seven years ago, although he’s been a summer visitor since the 1940s. Truro, the Cape’s smallest town, is like a wilderness outpost compared to other areas of the Cape. Seventy percent of the town lies within the Cape Cod National Seashore, which has checked development and maintained the majestic beauty of the Atlantic coastline’s towering sand cliff, pristine beaches and woodlands …..
"The town seems to attract an amazing collection of people with talents in many fields, who can’t seem to give up and just lie down and retire, " noted Strauss, an actor and director who last summer founded Payomet Performing Arts, which presents plays, readings and music. "They just keep on going, and they contribute in many ways to the quality of the town’s life, and are constantly challenging each other to keep searching, reaching." Artists and writers have been coming to Truro for years, inspired by its natural beauty. American scene painter Edward Hopper lived more than 30 years in the Pamet River Valley, Sebastian Junger ("The Perfect Storm"), former Poet Laureate Robert Pinsky, and Pulitzer Prize -winning playwright Paula Vogel are among the contemporary literati who own homes here. Summer arts workshops attracting world-class artists and writers are offered by the Truro Center for the Arts at Castle Hill, a 25-year-old institution. The Pilgrims were among the first explorers. Their first drink of fresh water in the New World came from Pilgrim Spring, and the cache of Indian corn they found helped them survive their first winter. The town has been home to fishermen and once schooners were built on a site near the Pamet River. One of the nation’s oldest golf courses, the Highland Links, is located on a bluff near Cape Cod Light. HENRY DAVID THOREAU was a fellow who knew a thing or two about ponds, and when it comes to the ponds of Wellfleet he makes their very names sound deeply evocative. "Our host took pleasure in telling us the names of the ponds, most of which we could see from his windows, and making us repeat them after him, to see if we had got them right," Thoreau wrote in his book "Cape Cod” of a memorable visit to an oysterman’s shack on the Herring River. "They were Gull Pond, the largest and a very handsome one, clear and deep, and more than a mile in circumference, Newcomb’s, Swett’s, Slough, Horse-Leech, Round and Herring Ponds, all connected at high water, if I do not mistake." When you think of the Cape Cod town of Wellfleet, the kettle ponds, as they are known, are not the first thing that comes to mind. Far more iconic are the crashing ocean beaches, so dramatic they seem like the Platonic ideal of the species, or the bay beaches, with their drop-dead gorgeous sunsets. But for Zenlike swimming in little seas of tranquillity, sometimes with so few people around that the water seems yours alone, the string of freshwater ponds in this part of the Cape has no equal. I have known the Wellfleet ponds for a long time. Back in the 1980’s, when a Cape vacation seemed the perfect thing for a family with a toddler, we started going there regularly. For a small child, they are great: Unruffled, never chilly, shallow at the edges and fringed by beach, the ponds offer all the ease and safety of enormously large and beautiful bathtubs. For an adult, they are equally appealing, especially the smaller, more secluded ones: you can swim round and round like a lazy otter, with only the occasional lily pad to interrupt your journey. Scientists find kettle ponds endlessly fascinating. There is no end of books that explain how, 13,000 or 15,000 years ago, huge blocks of ice left over after the glacier retreated began melting, leaving holes known as kettles that ultimately filled with water. 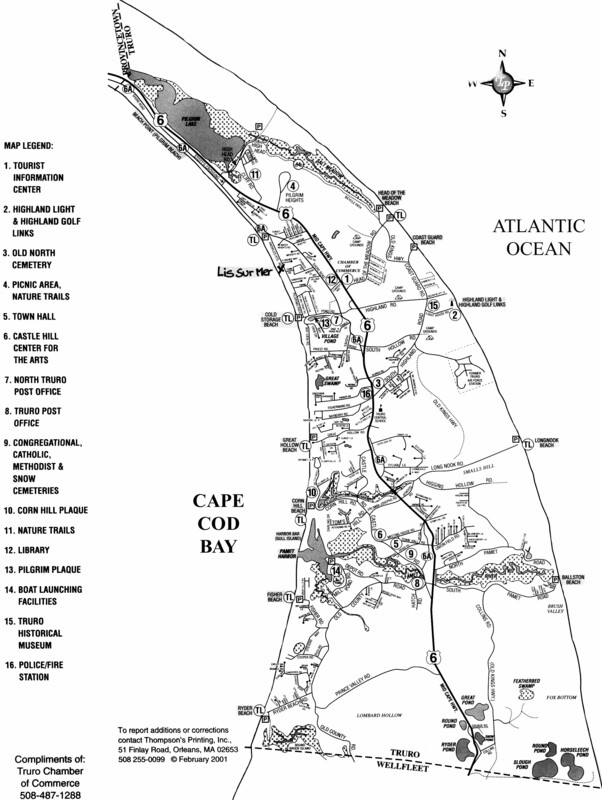 The Kettle Pond Data Atlas, a 110-page publication (not counting the bathymetry maps) of the Cape Cod National Seashore, bristles with data about the ponds’ past, present and future, along with a list of "frequently asked questions." Thankfully, you don’t need to know about bathymetry maps or much of anything to appreciate the quiet glories of these places. The National Seashore identifies 20 official ponds in this part of the Cape, most in Wellfleet but a few in neighboring Truro. Best known are the three big ones – Great, Gull and Long – all of which are on main roads. But far more enticing are the smaller, out-of-the way ponds, reachable by traipsing through the woods or across what seems to be other people’s property. We always called them the hidden ponds; the term is relative, but it captures the general idea. A good place to begin a pond odyssey, and the place we began ours, is Snow Pond, a little thing just over the Truro border. Snow is an ideal starter pond. Toddlers play at the edges, and an adult can swim around it in no time, all the while waving cheerfully to the family back on land. Ryder Pond, a short distance away, is a haven for youngsters in search of baby frogs, although anyone who cares about the ponds frowns deeply on the common practice of catching the poor creatures, and let it be noted that our child, being terrified of frogs, never laid a finger on any Cape amphibian, alive or dead. Since parking near the sluiceway was never easy and is now impossible, one strategy is to pick up some sort of craft from Jack’s Boat Rentals on Gull Pond, paddle across Gull, portage over the sluiceway into Higgins and drift from there into Williams Pond, a small gem that is blanketed with white and yellow lilies and is miraculously quiet, even when back at the sluiceway children are screaming hysterically. As you meander into its farthest reaches, you’re not sure exactly where you’re going but certain you’re not far from home; these are ponds, after all. The mood is soft and dreamy, and the setting so silent that the plop of a bullfrog into the water has the punch of a gunshot. The snapping turtles seem like visitors from another planet. We loved the sluiceway. But upon discovering Dyer Pond, we concluded we had found the prince of ponds. Part of Dyer’s charm is that getting there is a total pain in the neck; by the time you arrive, you can’t help but enjoy yourself because the journey has taken so much effort. Being hidden in the woods, with no legal parking anywhere in the vicinity, considerable effort must be expended figuring out what to do with your car. If you arrive at Great Pond very early or very late in the day, when parking spaces are still available (this is practically never), you can park and walk the 15 minutes to Dyer, assuming you know which of the many seemingly identical dirt trails to follow. That approach rarely works. Most of the time we use a more makeshift system: cruising the surrounding neighborhood and begging homeowners to let us borrow their driveways – i.e., park our car there – "just this once," as we inevitably promised. In the early days, when we found ourselves lugging all the paraphernalia a family with a small child lugs, the trip took a while. But it was, as they say, worth the journey. Of all the hidden ponds, Dyer is arguably the most hidden, the most beautiful and the most serene. The beach is narrow, making it less attractive to families seeking a large swath of turf. And being surrounded almost entirely by trees, it is bathed in pine-scented shadows much of the day. The water is silky, blissfully free of weeds or tangles, and to swim around its circumference is an almost intoxicating experience. For years we looked on Dyer as our own private find and talked endlessly about renting a house there. It wasn’t easy – there aren’t many – but last year we found the closest equivalent, a house just over the Truro border within walking distance of Horseleech. Not being hidden in the woods, Horseleech doesn’t have quite the enchanted charm of Dyer, but being on a back road that branches off another back road, it never gets much traffic. This is a good thing, because last summer something happened to the ponds that, in the eyes of some residents, was at least as harmful as messing with their delicate chemistry. They got famous. The instrument of that fame was an affectionate article in The Boston Globe, by a writer named Robert Finch, who set out to swim all the local ponds. One person who still has decidedly mixed feelings about the publicity is a 40-year-old photographer and filmmaker named Nate Johnson, a longtime "wash ashore," as visitors-turned-permanent-residents are called, and in the words of one local newspaper, the Jacques Cousteau of Wellfleet. Mr. Johnson, a voluble man who has immortalized the ponds through film, photographs and lectures, describes the more out-of-the-way ones with the lovely label "meditation" ponds, and in his opinion, they were none too hidden even before the article appeared. "Lots of locals wouldn’t even talk about the ponds to nonlocals," he said. And don’t get him started on the plastic alligators. The arrival of lawn chairs was, in his eyes, the last straw. Maybe. But tranquillity is relative. Some of the ponds still seem pretty tranquil to me. If you live in a city like New York, where a person must be literally standing on your shoes to seem uncomfortably close, where silence means barely hearing the roar of the West Side Highway outside your window, a place like Dyer Pond seems practically off the grid, even if you can see the occasional lawn chair once in a while. 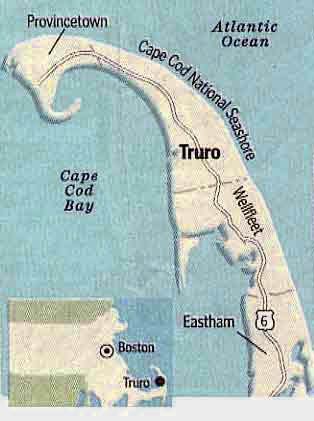 Cross onto the Cape via the Bourne or the Sagamore Bridge and take Route 6 east to Wellfleet. The three larger ponds are clearly visible from main roads (Great Pond off Cahoon Hollow Road and Gull and Long Pond off the roads that bear their names). Information about the ponds is available at the Wellfleet Information Center, off Route 6 in South Wellfleet, (508) 349-2510, www.wellfleetchamber.com (click on Beaches) or by contacting the Cape Cod National Seashore, 99 Marconi Site Road, Wellfleet, Mass. 02667; (508) 349-3785, www.nps.gov/caco. The best way to find any pond, especially the more out-of-the-way ones, is to use a detailed local map, available at the information center. Stickers – which are available to residents, taxpayers and people staying in Wellfleet, but not to day-trippers- are needed to park at the three larger ponds June 28 through Labor Day and to fish at all freshwater ponds. In Wellfleet, stickers are sold at the Beach Sticker Booth on the Town Pier, (508) 349-9818; freshwater fishing permits at Town Hall, 300 Main Street, (508) 349-0301; in Truro, permits at Town Hall, 5 Library Lane, (508) 487-2702. Canoes, kayaks, Sunfish, sea cycles and surf bikes are available at Jack’s Boat Rentals on Gull Pond, (508) 349-9808. Eric Gustafson, (508) 349-1429, offers guided kayak tours of the ponds and surrounding waterways. CONSTANCE ROSENBLUM is editor of the City section of The Times. Blackfish very nice dining, dinners only, cut above food. Near Truro Post Office. Terra Luna restaurant on route 6A close to the cottages. Small, cozy, good. Savory on route 6 across from the school. Wifi, coffee, pastries, pizza, paninis, burgers, plus newspapers. Salty’s Market Convenience items, some wines and beer soda. At crossroads in N. Truro and route 6A. Chequessett Chocolate Cape Cod craft chocolate and factory tours, 8 Highland Rd., N. Truro. Between Salty’s (formerly Dutra’s) Market and the highway exit. Pool and workout center, jacuzzi, sauna, steam room across from Top Mast motel on route 6A. Yardarm Liquor Store route 6 Truro. Snows Park Concerts on the Green mixed venue and relaxed family vibe. Across from the Truro Post Office, parking in lot or on road. Find them on Facebook for a current schedule and more info.